Welcome to this class project for Honors 3396E: Free Speech, Free Press and the Supreme Court of the United States. In the spring semesters between 2012 and 2019, students in this honors class at Texas State University researched and wrote these essays about free speech and free press issues in countries around the world. The students explored contemporary and historical events in their chosen country as they relate to free speech and press issues, and they critically compared these events with free speech and press rights in the United States. Check the tabs above to read about a particular country and to read about the student authors. The class is taught by Gilbert D. Martinez, J.D., an assistant director and senior lecturer in the School of Journalism and Mass Communication at Texas State University. Questions should be directed to him at his email address, which can be accessed by clicking here, his professor webpage. Pictured below are students from the 2018 class during a field trip to hear oral arguments in the Texas Court of Criminal Appeals. Afterward, the class also met with the Honorable Melissa Goodwin, justice with the Third Court of Appeals (pictured below, far left). From left to right: Jade Hinnant, Keely Freund, Kendall Allen, Claire Partain, Kendall Ward, Hannah Robinson, Triston Giesie, Colin Morris, Jakob Rodriguez, Nick Williams, Nereida Jaimes, Erin Copeland, Caitlin Gold and Morgan Morrow. 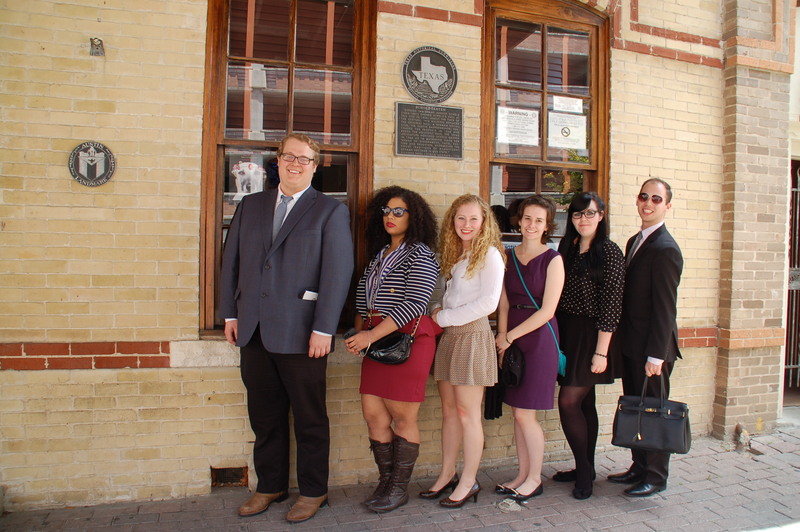 Pictured below are students from the 2017 class during a field trip to hear oral arguments in the Texas Court of Criminal Appeals. 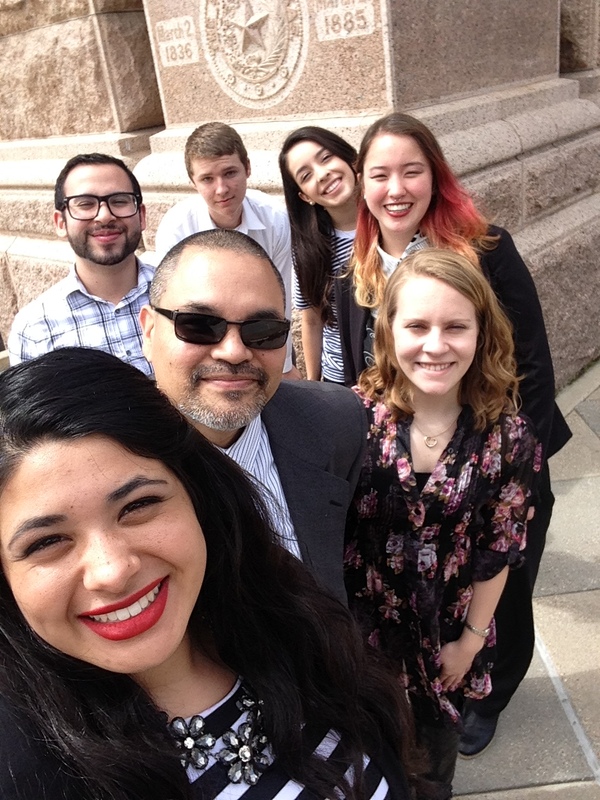 From left to right in the front are Holly Hearn, Victoria Whitwell and Leela Schooler; in back are Brooke Wilhelm, Araceli Castillo, John Espinosa, Yunuen Alvarado, John Hernandez and Julianne Castillo. Pictured below are students from the 2016 class. Pictured, from front to back, are Gilbert D. Martinez in front; Victoria Baxter, Ethan Durand and Jonathan Check in the second row; Iris Gonzalez, Darcy Sprague, Corey Pohlmeyer and Kambiz Shabankareh in the third row; Naomi Faltin, Kelly Woytkewicz and Samantha Ciaramitaro in the fourth row; and Toni MacCrossan and Tripp Holdridge in the back row. Not pictured are Amber Byer, Lesly De Leon, Madison Neidlinger and Caleb Ritchie. 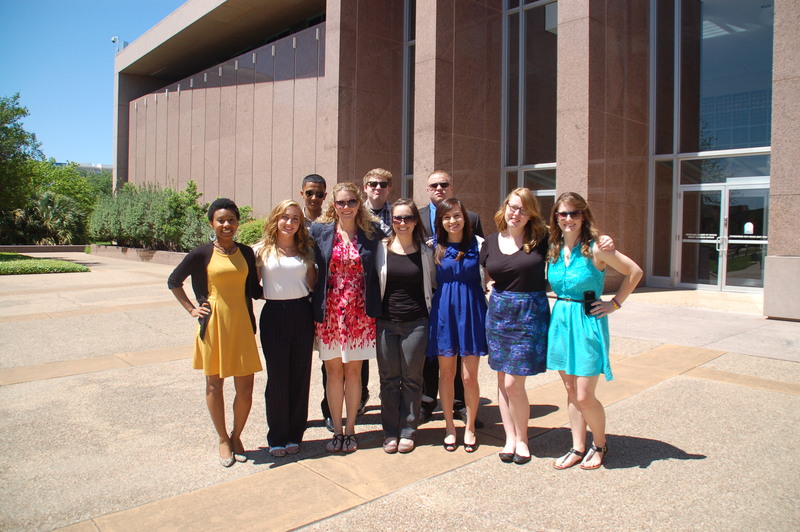 Pictured below are students from the 2015 class at the Texas State Capitol. Pictured, front to back, are Alicia Dorado, Gilbert D. Martinez and Katie Coleman; in back are Josue Plaza, Jackson Hvizdos, Carla Lozano and Crystal Winger. Photo by Alicia Dorado. Pictured below is the 2014 class in front of historic Scholz Garten, the oldest operating business in Austin and popular restaurant among government workers and politicians. Pictured, from left, are Nathan Moore, Aja Brooks, Kathryn Price, Tara Pohlmeyer, Hailey Morphis and Christopher Henry. Pictured below is the 2013 class in front of the building that houses the Supreme Court of Texas and the Texas Court of Criminal Appeals in Austin, Texas. Pictured (front row, from left): Lisa Sargent, Tori Hale, Stephanie Moore, Ani Aroian, Laura Villalobos, Jessica Luhrman and Samantha Sheffield; in the back row, from left: Juan Saladana, Ian Peters and Stephen Gilbeaux. Not pictured is Jessica Loechel. Photo taken by Gilbert D. Martinez. 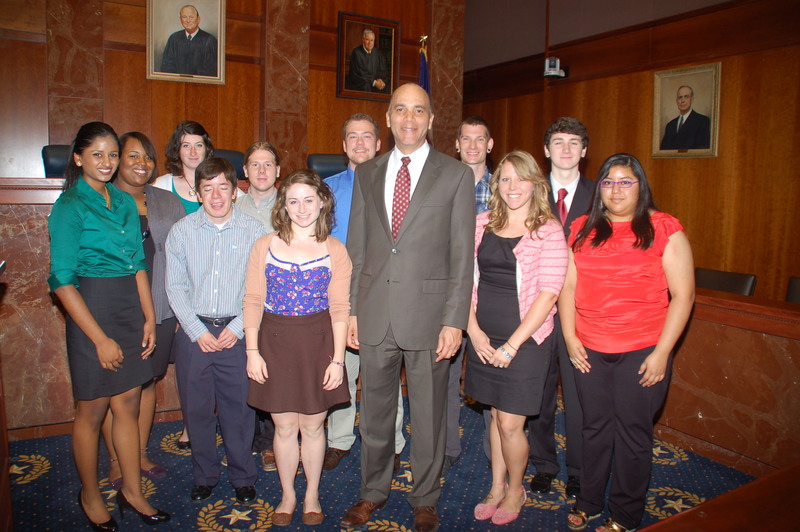 In the photo below, honors students from the Spring 2012 class join Chief Justice Wallace B. Jefferson at the Supreme Court of Texas. Pictured, from left, are Sophia George, Brittany Howard, Kaitlyn Chant, Christian Penichet-Paul, Andrew Rogers, Shannon Williams, Joseph Harmon, Chief Justice Jefferson, Chris Eudaily, Stacey Coates, Matt Sheehan and Minerva Hernandez-Garcia. Not pictured are Stephanie Daul, Haley Davis, Abigail VanWinkle, Liza Winkler, Matt Wood and Karen Zamora. Photo taken by Gilbert D. Martinez. A note about the background image of the world map: The image was created by Petr Kratochvil and is in the public domain. The image can be accessed by clicking here.